Opening on November 10 for three months, at the Bank of Thailand Museum in Chiang Mai, Thailand, is a textile art collection based in Brattleboro and images by a photographer from Putney. The exhibits share in celebrating Bhutan and its exquisite art of weaving. This exhibition happens just days after the historic coronation of 24-year-old HRH Jigme Khesar Namgyel Wangchuck, the new King of Bhutan, who is overseeing his country's peaceful transformation into a democracy. The Bommer Collection consists of rare and brilliant weaving and ornaments that have been gathered by textile art collectors Jay and Rungnapa Bommer of Brattleboro. The Bommers collaborated with the Asian Cultural Center of Vermont in 2007 to create the original exhibition in West Brattleboro. This 2008-09 Chiang Mai exhibition has quadrupled in size the number of pieces displayed to a total of one hundred fifty-four. 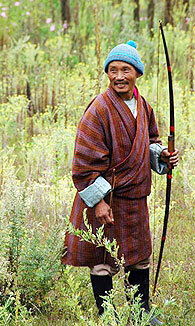 The collection features the Bhutanese national dress, including full apparel with accessories for women and men. 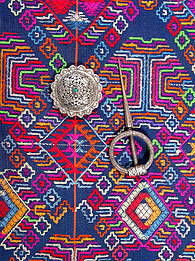 Also exhibited are rare ceremonial tunics and utilitarian objects of the Bhutanese. Weaving is prized in Bhutan as high art and an economic engine that figures prominently in their country's commerce and social etiquette. The Bommers' collection has developed over the past two decades of extensive travel in Asia. Jay has co-written seminal research on Burmese textiles, and Rungnapa is training herself how to preserve and mount antique textiles using international standards. As in the 2007 Brattleboro exhibition, Torie Olson's fine art photography of the Bhutanese and their land complements the textiles. Fifty of Olson's large-format photographs feature a compelling series of recent portraits of the Bhutanese people in their exquisite garments. The images also focus on Bhutan's dramatic architecture, lively markets, masked dancers, textile artisans, monastic communities, and the Bhutanese landscape. Torie traveled to Bhutan in 2007 to photograph and research the kingdom's rich weaving tradition and age-old herding system. As a photojournalist and volunteer development consultant, Olson's focus is on documenting, promoting, and preserving the world's traditional arts and rituals before they're lost to globalization, imitation, and repression.